With the lowest moisture transmission rating Armor Roof Shield is the best roof coating at keeping water out of your building. The only thing more water tight would be a pool liner! It also has superior adhesion(cannot be separated from roof material), elongation(500%), memory retention(99.9%) and abrasion ratings(Shore D Hardness-60). This is an often overlooked factor/mistake made by customers who unknowingly purchase roof coatings based solely on price or name recognition without comparing or even looking at the product specifications. Many companies publish little or no specifications due to poor test results. So simply buying a product off the shelf or from some mass retailer with no knowledge of the performance specifications is not the right approach for doing a commercial roof job. At ArmorGarage we feel who you buy from is as important as what you buy and it's why all our Sales Reps have extensive field experience with all the products we sell. Vapor Transmission rating or Permeability of a roof coating is what determines how much moisture can pass through the coating over a period of time. As your roof or roof coating ages it becomes more permeable which simply means that the molecular bonds start to weaken and the pores of the coating get larger due to stretching and UV aging, eventually water starts to actually pass through your roofing material or coating. That's why sometimes you can't seem to stop the leaks no matter how many flashings, small cracks or pits you patch. It's because the water may be slowly passing through the pores of your roofing material or coating over a large area and then running to the first opening. In which case finding and patching the leaks becomes a costly and futile effort. The majority of roofs start leaking due to this issue, in other words they just simply stretch and wear out from UV exposure and the elements. So you want to start out with a coating that has the lowest permeability rating(moisture transmission)and highest rubber content as you can so that as the coating ages and the pores start to open up from UV degradation and stretching it will still repel water. If you start out with a high permeability rating and a low or no rubber content it only takes a surprisingly small amount of aging and stretching till that coating fails. Also the type of rubber is very important, we use Butyl rubber which is the highest grade of rubber for coatings. 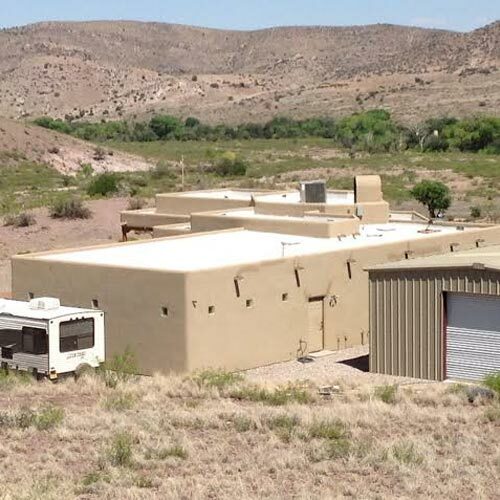 Armor Roof Shield has by far the lowest Vapor Transmission rating and under the ASTM G53-9000 HOUR Accelerated Weather Test which subjects the coating to extreme UV exposure and temperature swings, it showed no degradation or loss in permeability! It's why we offer a 12 year guarantee and no one else can and doesn't! Some other brands offer much longer guarantees but actually state that they do not guarantee results or you can't walk on your roof! What kind of guarantee is that? If you cover your entire roof with Armor Roof Shield it's guaranteed to stop your leaks! It flows into every tiny crack, crevice and pin hole and forms an impenetrable barrier that is impossible for water to pass through. When we say Armor Roof Shield is the toughest roof coating there is we mean it! This is the Light Gray Armor Roof Shield in our extreme weather test. 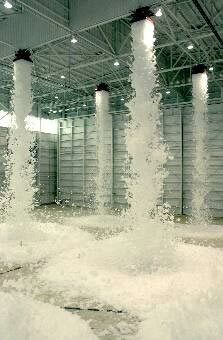 Don't try this with your water based elastomeric. The force and abrasion would rip regular roof coatings to shreds. The following is a testimonial from our customer Patricia Jarimillo that shows how tough our roof coating really is. In addition to Patricia there's a testimonial from one of our metal roof customers that lives in an historic neighborhood that had over 80% of the roofs destroyed by a severe hail storm while his roof suffered only minor cosmetic damage. Between the severe weather testing we do and the real world hail storm testimonials we're not sure what else we can say. Here is our review of ArmorGarage Flat Roof Coating. It's great! This review comes a year after we used your product on our roof so it's more a testament to the quality of your product then merely getting the job done. We've had several heavy hail storms and rains and of course, we had to go up and check out the roof. There were no dents, no peeling or lifting of the product, no pooling and no bubbling or stretching. It looked perfect. My husband says, "That stuff really works." 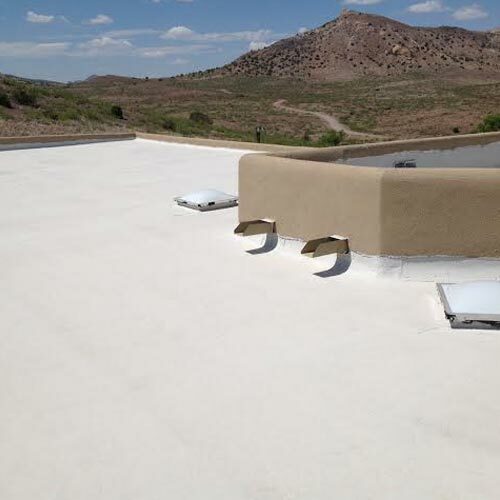 As stated, the Flat Roof coating bonds to the roof and is not merely a latex coating that will eventually peel when water gets under it from a crack, dent or hole produced from hail. It doesn't peel off gloves or boots either. We also noticed right away that the solar coating aspect of the product helped to cool the interior by at least 10-15 degrees. Great product. Our roof size required 22 buckets which we consider an investment. Thanks, Patricia - Hillsboro, NM." 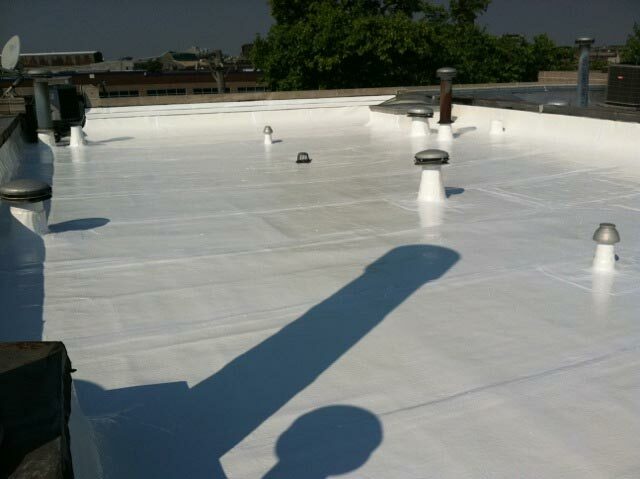 The following images are from Patricia's Roof Coating project. Here's a comment placed in our comment box on the checkout page from a customer who was reordering more roof coating to do the rest of his rubber roofed trailers. Comments: "Your product is beyond belief. You should see what it accomplished on my rubber roofed trailers, just incredible". Scott from Tacoma WA. Scott has promised to send us some pictures. We'll post them as soon as we get them. WE OFFER NATIONWIDE INSTALLATION FOR ALL OUR ROOF COATINGS ON ROOFS 30,000 SF AND LARGER. CALL FOR QUOTE. 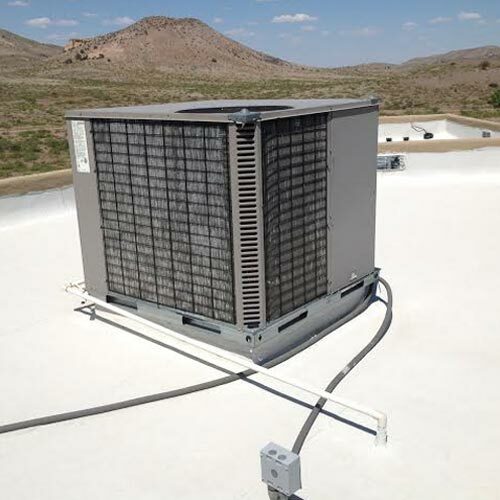 Available with embedded rubber granules version for roofs that have areas that are walked on regularly such as roof decks or areas around roof mounted mechanical equipment. Rubber Granule Version is applied with trowel if using roller thin slightly with Xylene. If doing walkways or areas around roof mounted equipment, a base coat of standard coating can be applied first and then second coat with granule version on high wear areas is acceptable. Once you have applied two coats of Armor Roof Coating you will have 12 years of guaranteed leak free service from your roof! Proper repairs to all flashings or other defects in roof with ArmorGarage Roof Mastic is required prior to application of coating. Coating must be applied to entire roof for warranty coverage. Once a year routine inspection/maintenance is recommended to remove any accumulated debris and to ensure roof drains are clear. Guarantee shall consist of coverage for delamination or erosion of the coating during the warranty period, coating must be applied to entire roof surface, there is no guarantee for partial roof coverage. We have never had an actual product failure but should you feel that the product has failed for any reason we request that the property owner notify ArmorGarage by email or fax with a description and nature of failure. On substantiation of a product defect, ArmorGarage, as its sole liability and the property owner�s exclusive remedy, will provide sufficient replacement product to repair all affected areas. 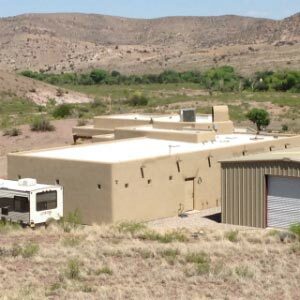 ArmorGarage is not liable for any labor or consequential damage costs such as but not limited to mold or mildew damage, loss of use or any damage to property. Exclusions to warranty: Damage arising out of failure to apply coating in accordance with our instructions, natural disasters and acts of God or nature, shifting or swelling of the roofing system or structure, exposure to destructive chemicals, over accumulation of organic materials or other roof debris, failure of previously applied coating(s), acts and causes beyond our control, negligence, misuse of the product, and cosmetic changes in coating appearance. Failure of product due to ponding water areas that lasts longer than 48 hours after last rainfall. For these areas use our Roof Pond Coating. Because there are extenuating factors beyond our control it is the purchaser's responsibility to repair all roof defects properly such as delaminating or damaged seams, flashings, mold, mildew or badly deteriorated roofing material prior to application of our roof coatings, to apply product at recommended thickness to a listed compatible surface during proper weather conditions. To order, divide roof square footage by 250 and that will be the total number of 5 gallon buckets you need to order for two coats. To determine the number of 50 Gallon drums divide your square footage by 2500. Once you get the number of pails or drums you need to select the appropriate quantity in the quantity discount box if more than 4 to get the appropriate discount. Then enter the number of pails or drums in the quantity box to get your total discounted price. Example: Roof is 2000 SF. Divide by 250 for a total of 8 pails. Select the 5-10 option in the quantity discount box to get 50.00 per pail discount and then enter 8 in the quantity box for your total price. Coverage for roof coating with rubber granules is approximately 100 sq ft per 5 gallon pail. 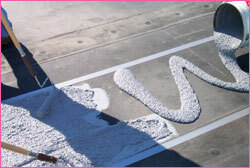 The following series of images perfectly illustrates how to do a proper commercial roof coating job. Please take note of the roof to the right it has an Aluminum Fibered Roof Coating on it that is failing after only 3 years. That is the reason this owner chose Roof Shield for this other roof. SEAMS AND FLASHINGS PATCHED WITH ROOF MASTIC. ON VERY LARGE ROOFS IT IS NOT NECESSARY TO DO ALL THE SEAMS, ONLY THE DEFECTIVE ONES. AFTER TWO COATS OF WHITE ARMOR ROOF SHIELD. THIS IS NOW A 15+ YEAR ENERGY EFFICIENT ROOF! Product should be stored indoors for 24 hrs before using. SURFACE PREP: Roof must be cleaned of all dirt, debris and residues, scrub any mold or mildewed areas with chlorine or bleach solution. Power wash if possible. Patch any damaged areas, visible cracks, punctures or areas that have completely worn through, use our Roof Patch Mastic for best results. Visually inspect all roof flashings, seams for debonding, all penetrations and repair as needed. Only seams that have split apart or cracked need to be patched, same with curb flashings, only flashings that have cracks or pit holes need to be patched. 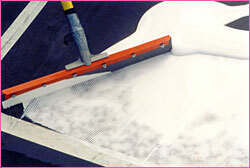 Embed roof mesh into Roof Patching Mastic for extra strength and flexibility. All ponding areas should be coated with two coats of Roof Mastic, embed layer of roofing mesh in first coat and then apply second coat. Let the mastic dry and then coat with Armor Roof Coat. Any ponding areas that hold water 72 Hrs or more should be repaired by the installation of roof drains or repitched. 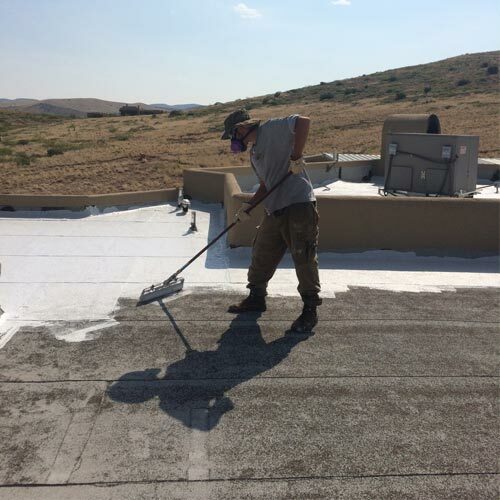 Armor Roof Coat is very forgiving as it will cover up many types of small mistakes but a little extra time and effort in prepping your roof will result in a much higher quality job. 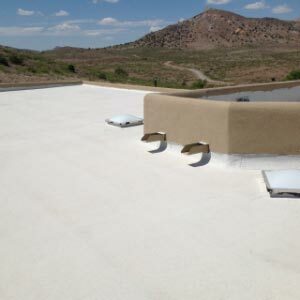 APPLICATION: Roof Coat is easily applied by just about anyone and requires no special skills or experience. The main objective is to get an even coating over the WHOLE roof. If you do that, Roof Coat will take care of the rest. 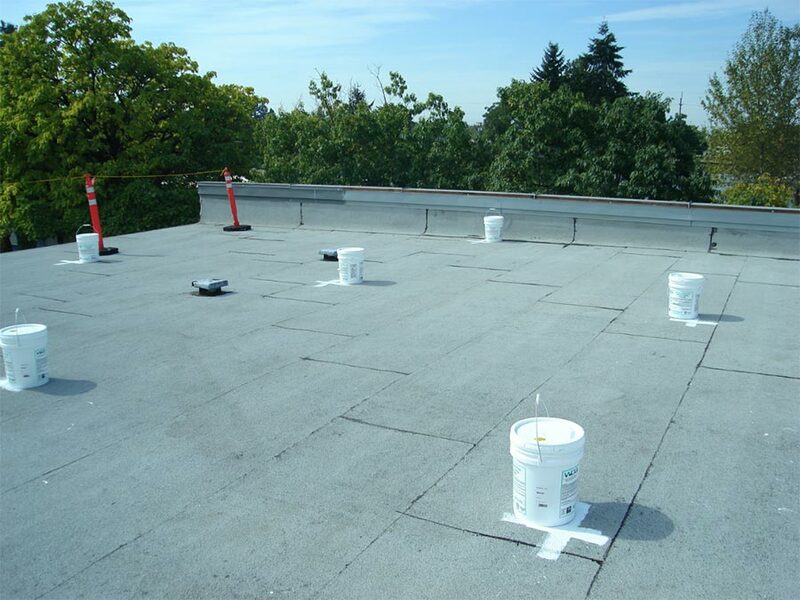 On Large roofs after it has been cleaned and prepped mark out 500 square foot sections as shown in the image below and place a pail in each section. Mix the coating in can with paddle mixer on low speed. 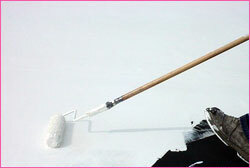 Use a high quality brush to coat any hard to reach areas first. Pour entire pail out over a section and apply as shown below. This is a simple fool proof way to ensure you apply the coating at the proper spread rate. Back roller over squeegeed area with roller. Roller out to 100 sq ft/gallon. Then proceed to next section and repeat until entire roof is coated in the same manner maintaining the 100 SF/Gal spread rate. Roof Shield can be applied from roof right up parapet walls. Allow first coat to dry(24-48hrs)until dry and hard to the touch then apply second coat. For best results apply second coat perpendicular to first coat. If need be you can wait several days or a week or two between coats, the second coat will reactivate the first coat and the two coats will bond and cure into a single monolithic rubber surface. Be sure to cover every inch of roof surface. 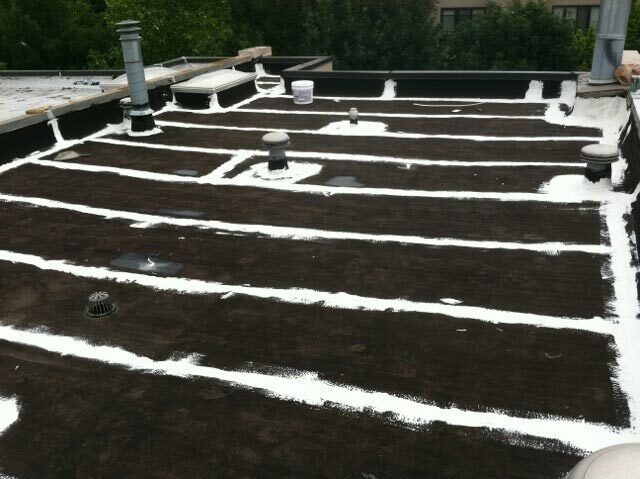 As long as you get the coating on 100% of the roof surface there is no possible way water can leak through. Tip: Make sure you check the inside of all mechanical equipment and the flashings around all roof penetrations, often water penetrates the inside of roof mounted equipment and other flashings, finds its way down to the roof deck and runs to an opening which could be far away from the original leak source. Armor Roof cannot be sprayed with light duty sprayers designed for water based products. Use a Commercial Airless Sprayer with 3300 psi, .85-1 gpm minimum with a .027- .031 tip with 3/8" ID hoses. For hose lengths greater than 60' use 1/2" ID hoses. Graco models-Ultra Max 695 or Graco GMax 3400 or higher. Depending on sprayer thinning with 8-10ozs Xylene per 5 gallons may be needed for proper spray pattern. Maintain the 100 sq ft/gallon spread rate. Application for rubber granule version is by trowel with average coverage approximately 25 sq ft/gallon. A base coat of the standard coating topped with one coat of the granule version on walkways or around mechanical equipment is acceptable. 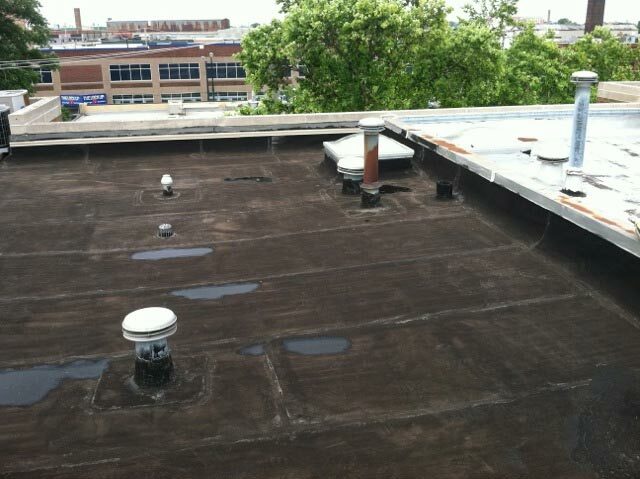 A test patch should always be done first when applying to any type of rubber roof to ensure compatibility. Solids by weight: 60%. Rubber Epoxy based! VOC: Meets All Federal VOC Requirements! UL Fire Rated. Compared to Silicon Coatings that are Flammable! Viscosity: 10,000 Krebs! Extra thick consistency means better surface coverage! Thermal Emittance: .89! Best Rated! Solar Reflectivity: Reflects 90% of the solar/uv spectrum radiated heat! Hardness: Shore A = 60! Highest Rated! Epoxy fortified it is extremely wear & puncture resistive! Foot traffic rated! Accelerated Weathering Test: 9000 Hrs under ASTM G53 Test-No degradation shown! Elongation: 500% MINIMUM, EPDM has a maximum 200% Elongation! Elongation Memory: 99.9%! Will not stretch out like water based or siliconized coatings do! Water Absorption: .04%. Best Rated! Vapor Transmission: ASTM E96: 0.025 perms. Best Rated! Compatibility: Good on all asphalt based roofs such as Modified, BUR, Granulated Cap Sheets, Tar and Gravel, Torch Down, etc. Flat or Pitched Roofs. Compatible with all rubber type roofing and does not cause swelling and debonding of rubber sheets from decking as other products do. Full Cure Time: 24-48 hrs @ 70 deg, 70% rh. Note EPDM Type Products Have A Cure Time Of Up To 7 Days and stop curing at temperatures below 55! 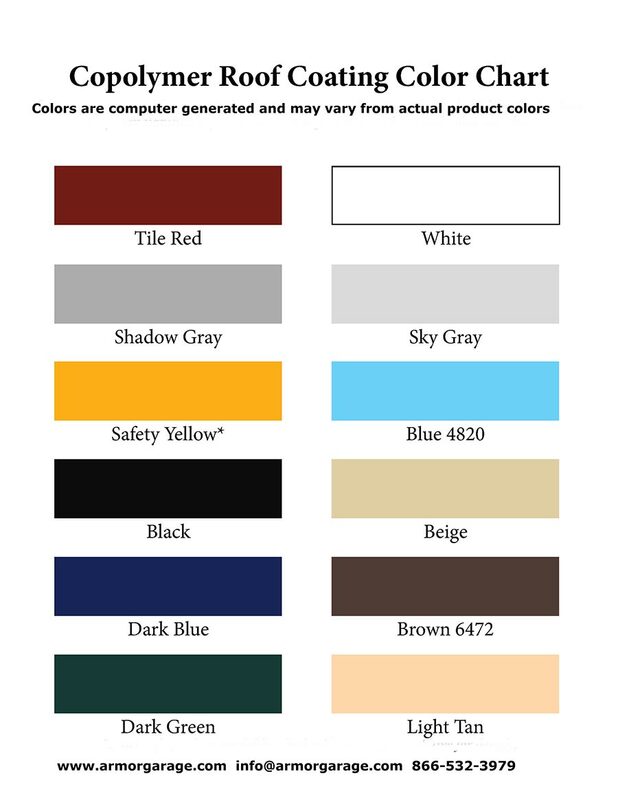 Colors other than White or Light Gray, allow an additional 5-7 days for delivery. Due to EPA regulations for ALL CA orders this product is only available in white and there is a 10% state surcharge added to original order confirmation total. Please refer to this page which has all the most asked questions and a lot of useful information that is critical to to know prior to making any roof coating purchase. Even ours! It is full of vital data that will help you determine the performance capability of any roof coating even if it's not listed on our chart. When trying to solve your roof problems you will either find coatings on your own or have one recommended to you. This will help you to quickly know whether that coating is worth your consideration. We get asked a lot about the warranty. It's 12 yrs but the coating is rated for 15-20 with simple routine maintenance. It's like when you buy a new TV it's guaranteed for 1 yr by the manufacturer but if you don't abuse it, it will last you 10 or more years.